Work can be maddening. It’s not so much the stress of the job nor the people involved, far from that in fact. It is understood that when you take a foreign assignment, there will be a step change in your responsibilities. Which in order to get to that point, you are already putting in your best effort where you currently are. So to bridge this gap in the short term, the only equalizer that you have is more time to dedicate to work until your capabilities and knowledge of the environment progress and your time spent can diminish, but more likely your responsibilities will continue to grow with your capability and your time remains the same. But this is the essence of career progression in the American sense I think… This part that is maddening, which to no fault of anyone here, except for me for imposing it on myself, is language and comprehension. Imagine if you will that inside my head, there is the understanding portion of my brain that only understands US Southern English, which is handicap #1. Now, not that southern is bad, far from it, to me it’s a very fun and entertaining form of English which anyone should be so lucky to be born into, but any regional bias must be overcome. Insert translator. The working language here is English, but recall, all English is not equal. During the course of my day, and often all at once, I get Thai English, Indian English, French English, and on a very rare occasion American English, but of course never my happy southern variant. So I have that translator working, and then there is this uproar in the background of Thai language, which I do really want to learn, but for now it’s a struggle to discern where 1 word ends and the other begins, but that part is coming along nicely. I hope to continue language training soon, after my Michelin work training ends and sometime before my periodic development training begins, which by the way never stops. Now as if this roar of the well-known and unknown isn’t enough, in comes French, as the majority of expats here are French. If I had to estimate the ratio, I’d say there’s 70% Thai, 10% other Asian countries, 19.? ?% French and me. Now I do speak some French, but if you have ever heard a French person speak in full cadence, it’s rather fast, and while I am capable of mostly understanding it while focused, my brain is quite busy with English and Thai. So while I hear them and want to listen to understand, because after all this grab bag of languages is making up a singular meeting, I struggle. It’s as if I hear the words, I know that I know them, but yet do not seem to have the capability yet to discern the meaning of phrases in real time. And the longer it goes the farther behind I fall until I unconsciously choose to jump back to the present moment and start the cycle over. Now I’m not discouraged as I never thought I’d be able to translate what amounts to 6 languages/variants into my native southern in the first week. These things too will come, but for now what is coming is a headache. And if that confuses you, well I’m not too sorry, welcome to my every day. 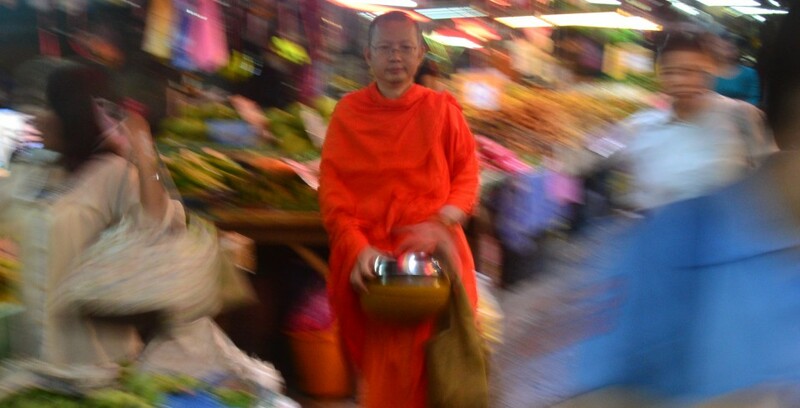 This entry was posted in Life In Bangkok and tagged adjusting, Bangkok, Culture shock, Expat. Bookmark the permalink.